We are completely honoured to be nominated for this year’s Music Nova Scotia awards. 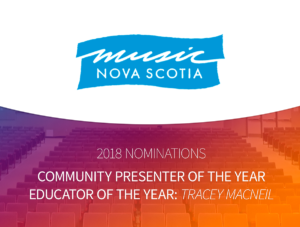 We have been nominated for Community Presenter of the Year and our wonderful Executive Director Tracey E MacNeil for Educator of the Year! This year, Nova Scotia Music Week runs from November 1 – 4 in Truro.